Do you know the real story behind St. Patricks Day? That is what we are exploring for the next two weeks. 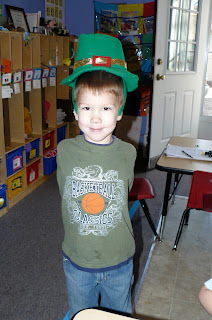 The past two days we have read a factual book about St Patricks Day. Ask your child what they remember. I put the oil pastels on the table today and the girls got busy. I love just taking out random things to see what they will do with them. Jessica- you see Clara’s window? Clara draws MANY doors and windows. Maybe she will grow up to be an architect. Another leprechaun and some rainbow art work on the wall from yesterday. Great white northern beans spray painted gold for counting. 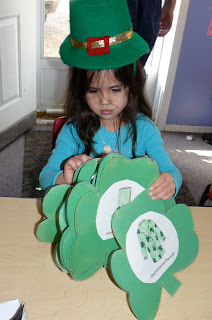 Stamping – I wrote Leprechaun on the paper to entice little hands to try – and they did ! Green playdoh and St Patricks Day cutters! Today we also read a story called ” The Luckiest Saint Patricks Day;” As tradition would have it, I TRY to read all my St Pattys Day books with an Irish accent. The kids at first look at me kinda weird but then they begin to smile and enjoy it. We looked on the map today to see where Ireland was. It was a LONG way away with lots of blue ( water ) between us. We used our transportation skills from last week to figure out how we would get there from Arkansas. We also watched an Irish jig. As we watched I pointed out how the dancers rarely move their arms – only their feet and legs. Circle time today opened with an Irish Jig and you should have seen the kids trying the dance. It was SO cute and made my heart smile. The second video is of us playing ” hot potato”. We talked about the significance of potatoes in Ireland and that they have EYES. The kids thought that was funny. Then we played a fun game.